The ornate Puerta del Perdon, the Door of Forgiveness, shows a view of the Seville Cathedral. 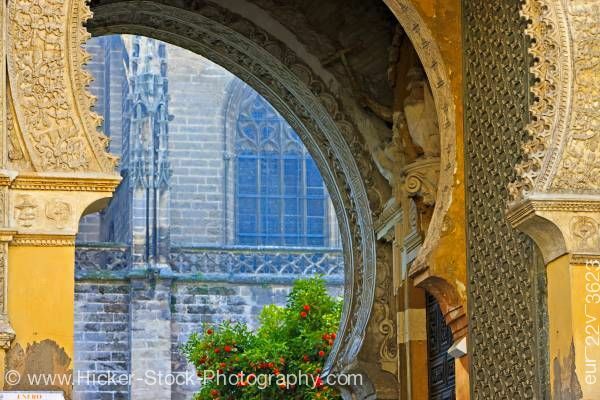 This stock photo shows an archway to look through Puerta del Perdon (Door of Forgiveness), Seville Cathedral and La Giralda (bell tower/minaret), a UNESCO World Heritage Site, Santa Cruz District, City of Sevilla (Seville), Province of Sevilla, Andalusia (Andalucia), Spain, Europe. The Puerta del Perdon, a beautifully ornate archway in colors of gold, brown and tan has a view of the Seville Cathedral. The detailed archway leads to the beautiful stone cathedral. A flowering bush sits between the archway and the cathedral. The Seville Cathedral is also very ornate with its arched window and buttress. Looking through Puerta del Perdon (Door of Forgiveness), Seville Cathedral and La Giralda (bell tower/minaret), a UNESCO World Heritage Site, Santa Cruz District, City of Sevilla (Seville), Province of Sevilla, Andalusia (Andalucia), Spain, Europe.